Heads up folks, the Brooklyn Youth Chorus is putting on its annual gala tonight (Tuesday, May 7) at Roulette. The BYC will be performing with the renowned Kronos Quartet and presenting commissioned works by such indie darlings as: Richard Reed Parry (Arcade Fire), Bryce Dessner (The National) and Shara Worden (My Brightest Diamond), just to name a few. Read the full press release below. Two pioneering, GRAMMY-winning new music organizations will unite when the Kronos Quartet performs with the Brooklyn Youth Chorus’ (BYC) Concert Chorus and Young Men’s Ensemble, May 7 at Roulette in Brooklyn. The program will feature music the Chorus commissioned from a range of celebrated composers: the world premiere of a piece Julia Wolfe wrote for BYC and Kronos; the New York premieres of BYC / BAM co-commissions by Aleksandra Vrebalov, Richard Reed Parry (Arcade Fire) and Bryce Dessner (The National, Clogs); and music for the Chorus by Shara Worden (My Brightest Diamond). The concert illustrates the Chorus’ growing role as a collaborative commissioner, producer and presenter of music showcasing its singers’ range, versatility and unique sound. The concert at Roulette (509 Atlantic Avenue, Brooklyn) begins at 8:00 P.M. Tickets for the concert only are $45 and can be purchased at www.brooklynyouthchorus.org. Tickets for the gala, which includes cocktails and dinner at the Green Building (452 Union Street, Brooklyn) at 5:30 P.M., begin at $375. All tickets can be purchased at www.brooklynyouthchorus.org or call 718-243-9447 x226. All proceeds will benefit the Chorus’ programming. Press release continued after the jump. The Kronos Quartet’s performance with BYC builds upon a relationship that began when the Chorus performed with the Quartet in Awakening, part of BAM’s 2011 Next Wave Festival. 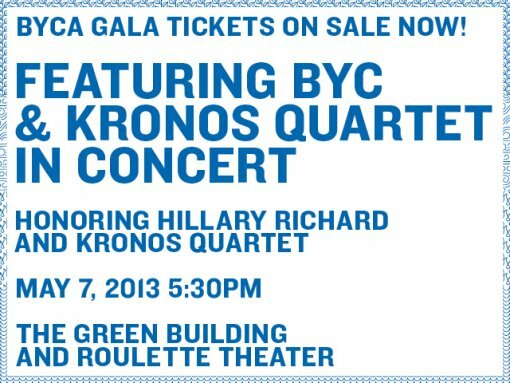 More broadly, the concert—and the gala beforehand, which honors the Quartet, along with BYC supporter Hillary Richard— celebrates Kronos as a longtime role model for BYC and its Artistic Director and Founder, Dianne Berkun-Menaker. Just as the Kronos Quartet has developed a unique identity by pushing the boundaries of string quartet repertoire, BYC is changing the perception of what a youth chorus can do by generating a daring range of original music in collaboration with some of the world’s foremost living composers. Time Out NY has written, “Apart from indicating the ensemble members’ tender ages, the term youth does not denote inexperience, but rather…a tireless hunger for exploration.” The May 7 concert features just some of the fruits of BYC’s nascent and already productive New Voices commissioning program; the Chorus has also sought out Nico Muhly, Missy Mazzoli, Paul Moravec and others. Aside from commissioning their own repertoire, the Chorus performs a wide variety of existing material. They Chorus has also been engaged, as guest performers, by the likes of Barbra Streisand and Elton John to Lou Reed and Grizzly Bear, and orchestras including the New York Philharmonic, the Baltimore Symphony and the Mariinsky Orchestra, to name a few. These upcoming engagements follow BYC’s recent performance with Shara Worden in the Ecstatic Music Festival Kickoff Concert, in which the Chorus unveiled new works commissioned from the My Brightest Diamond singer/songwriter and multi-instrumentalist Shara Worden. Previously, the Chorus performed in work-in-progress concert performances of Paola Prestini’s Aging Magician at PROTOTYPE, HERE’s celebrated new two-week festival of visionary opera-theatre and music-theatre works. The Chorus studies and performs a vast repertoire of music—classical and contemporary—and has an active commissioning program to develop new works for young voices across a variety of genres. BYC has appeared with acclaimed orchestras and conductors, including Valery Gergiev, Lorin Maazel, Marin Alsop, James Levine, Robert Spano, Esa-Pekka Salonen, and Reinbert de Leeuw as well as celebrated recording artists such as Barbra Streisand, Elton John, Lou Reed, Grizzly Bear and John Legend. BYC won a GRAMMY® Award for the world premiere live recording of John Adams’s On the Transmigration of Souls with the New York Philharmonic in 2005. Known for its polished performances, the Chorus frequently appears at such important music festivals as BAM’sNext Wave Festival (with the Kronos Quartet and Wally Cardona), BAM’s Crossing Brooklyn Ferry festival curated by indie-rockers Aaron and Bryce Dessner, the Ecstatic Music Festival and Park Avenue Armory’s Tune-In Festival. BYC has also garnered a strong reputation as an arts presenter with such major collaborative projects as Brooklyn Village, co-produced with the Brooklyn Philharmonic and Roulette Theater in 2012 and Tell the Way, co-produced with St. Ann’s Warehouse and featuring composer Nico Muhly in 2011. The singers receive training from the Brooklyn Youth Chorus Academy (BYCA)—a performance-based vocal music education program serving more than 400 students annually in six ensembles. Rehearsals occur at BYCA headquarters in Cobble Hill and a newly launched annex in Bedford-Stuyvesant. BYCA choristers, who are seven to 18 years old, hail from 71 different zip codes, reflecting the broad diversity of the Metropolitan area. For nearly 40 years, the Kronos Quartet has pursued a singular artistic vision, combining a spirit of fearless exploration with a commitment to expanding the range and context of the string quartet. In the process, Kronos has become one of the most celebrated and influential ensembles of our time, performing thousands of concerts worldwide, releasing more than 45 recordings of extraordinary breadth and creativity, and commissioning more than 750 new works and arrangements for string quartet. Integral to Kronos’ work is a series of long-running, in-depth collaborations with many of the world’s foremost composers, including Americans Terry Riley, Philip Glass, and Steve Reich; Azerbaijan’s Franghiz Ali-Zadeh; Poland’s Henryk Górecki; and Argentina’s Osvaldo Golijov. Additional collaborators from around the world have included Chinese pipa virtuoso Wu Man; the legendary Bollywood “playback singer” Asha Bhosle; Inuit throat singer Tanya Tagaq; Mexican rockers Café Tacuba; famed Azeri vocalist Alim Qasimov; and iconic American singer-songwriter, Tom Waits. Kronos’ work has garnered numerous awards, including a Grammy for Best Chamber Music Performance (2004), the Polar Music Prize (2011), and the Avery Fisher Prize (2011). A non-profit organization based in San Francisco, the Kronos Quartet/Kronos Performing Arts Association is committed to mentoring emerging musicians and composers, and to creating, performing, and recording new works.